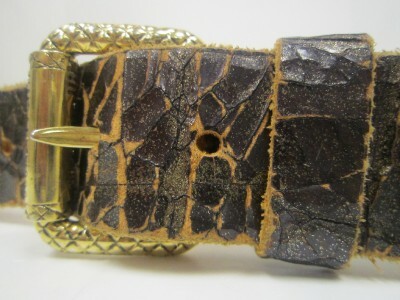 Authentic Just Cavalli bronze/brown crackle & gold shimmer distressed leather belt gold hardware #30099JR. 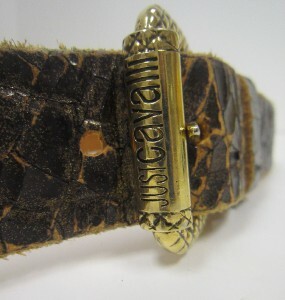 Just Cavalli logo on belt buckle. Strap length 35 1/2 inches. 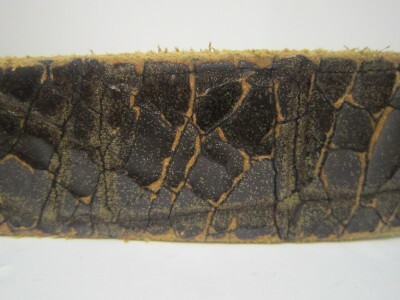 Width 1 1/2 inches. Buckle 1 1 /2 inches long x 2 inches wide. StealsandDealsDirect offers complete descriptions, images and measurements for ease of purchase. Please contact us through e-mail within 3 days of receipt of item(s)with any questions you may have. StealsandDeals Direct offers Quality Factory Overstock. Please feel free to e-mail us through the link at botttom left of each listing.